A violent eviction in Papua New Guinea has left more than 1000 indigenous people homeless. 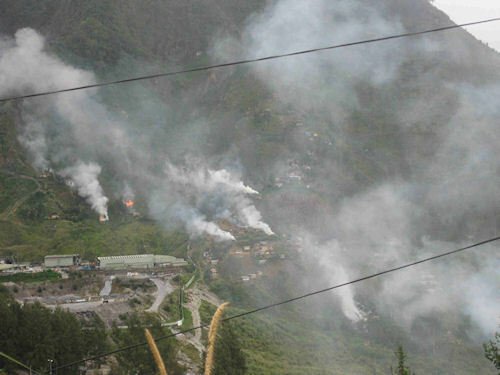 On April 27, more than 300 homes were burned to the ground in a violent eviction of indigenous landowners near Barrick Gold’s Porgera open pit gold mine in Papua New Guinea. At least 200 police and military personnel were sent to the village, and began setting fire to the landowners’ homes. The Akali Tange Association (ATA), a human rights organization in Porgera, said on the day of the eviction that that no one was given any time to gather their possessions, and “anyone who spoke up was reportedly physically attacked by the security forces and some were arrested,” relays protestbarrick.net. “Increasing numbers of people are reporting injuries, as are those who are being detained. Although the landowners received no formal warning that they were to see their houses destroyed – according to the ATA – Barrick Gold had demanded that the land be cleared of local villagers, some of whom are small scale artisanal miners eking out a living beside the mine,” protestbarrick.net continues. Employees of Barrick Gold assert that the landowners are ‘illegal’ and issued a memorandum one week earlier that demanded an end to their subsistence activities and for the landowners to abandon their territory. Also leading up to the eviction, Porgera MP Philip Kikala established a State of Emergency (SoE) in an effort to “restore peace” in Porgera. The landowners previously asked the government for help in dealing with some local problems. However, the police operation was carried indiscriminately. Mark Ekepa, chairman of the Porgera Landowners Association, insists that the SoE did not serve its purpose, that the police operation targeted innocent people, and that the homes police burnt down belonged to second and third generation landowners “who were not thought of by the National Government and Barrick Gold in their relocation plan in 1989,” states Ekepa. On May 2, the landowners announced thay are now planning to sue the police and government for the wanton destruction of their homes. 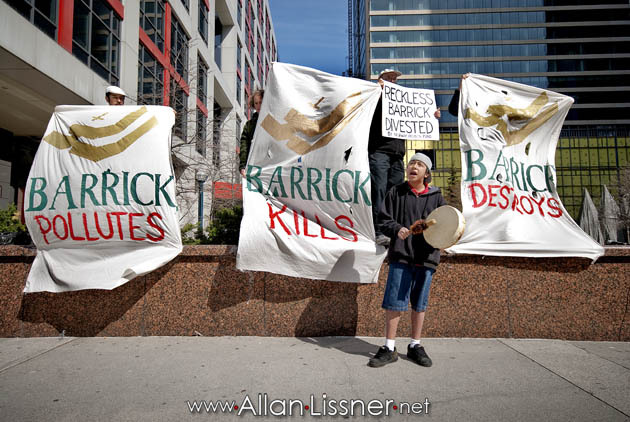 Meanwhile, in a strange and far away place called Canada, Jethro Tulin from the Akali Tange Association confronted Barrick Gold at the company’s Annual General Meeting (AGM) last week. Tulin was joined by indigenous delegates from communities around the world who are similarly effected by the company. Unfortunately, Tulin might as well have been speaking to a brick wall, because the company categorically denied everything he said. As far as Barrick is concerned, and “for the sake of the shareholder’s money”, they are faultless Champions who can do no wrong. The same is doubltess true for all of Barrick’s operations: on Shoshone Territory, at the Gold mine in Lake Cowal, at the Famatina camp in Argentina, at the North Mara open pit mine in Tanzania and elsewhere around the world. It’s all a figment of our imagination.